I stumbled across this SUV in a parking lot on Mavs Parade day. 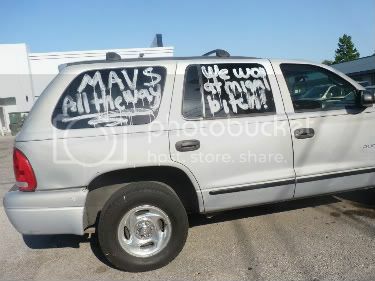 It's clear by the message scrawled on the windows that the owner is proud of the Mavericks championship win. Even though I was rooting for my hometown team the Heat, no one has rubbed the loss in my face...that's what's known as Texas humility. RoTFL wow there's no limit to what a true fan would do! Miami did a great job. I think it was rigged. Game 3 & 4 wade & lebron was soooo disconnected. I think the were told to chill, not this year. I'm gonna need them to just gon head and wash that off lol. It looks horrible! You know, when I see things like that I am so glad the Babby is not in a spelling phase... I can just imagine her "B... I... T..." and then me distracting her. I don't have a firm profanity policy in place yet, but some day it's going to come up for sure! So glad that you were not disheartened as a Heat fan by the celebration in Texas...as a Laker fan it was not very exciting at all for us this year. Talk about a diehard fan! Wow... that's a whole other level of fanatic. LOL. I agree with Alicia. I don't know anything I would get this enthusiastic about! That's a real big time fan!